The Best Denture Products - Which ones? I was surprised to discover a range of the BEST denture products all being produced by ONE company, designed and developed by leading Dallas dentist, Dr. Lorin Berland. Some years ago I made contact with Dr. Berland on a dentist's online forum. I was looking for advice, and he answered my questions in an expert and professional manner. I could tell straightaway that Dr. Berland is EXTREMELY knowledgeable, and also very patient, and happy to explain his knowledge in detail. Recently, he made contact with me again; he had been developing a range of denture products that he wanted to be THE BEST on the market. He remembered my interest in telling folks what I believe to be TOP OF THE LINE products, and asked me to review his ideas. When I looked at what Dr. Berland had achieved, I was very impressed! I told him I wanted to offer his denture products to my readers, but with a discount code, to make sure that you folks out there are getting THE BEST denture products at the best possible price. Because dental-health-advice.com has such a huge readership (almost half a million page views a month) Dr. Berland agreed to offer his products to my readers at a 20% discount, if they use a special discount code to order the products on his company website. The discount code you need is listed after my review of the products, at the bottom of the page. But first, let's look at the products on offer. 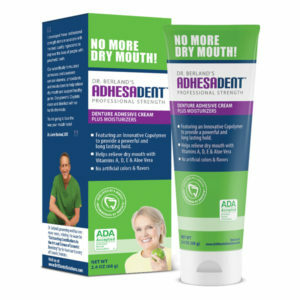 Adhesadent is a new design of denture adhesive. It is a unique combination of an adhesive copolymer with aloe vera and vitamins A,D and E. This moisturizes and protects the mouth and gums. The new copolymer delivers a powerful and long-lasting adhesive hold, while working to heal and prevent dry mouth. It normally retails for $9.95. You can read more and place your order with a 20% discount at Dr. B Dental Solutions. 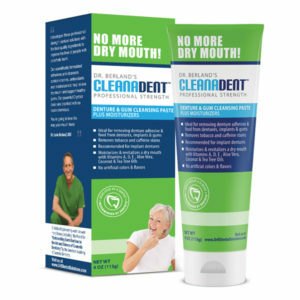 Cleanadent Paste is a SPECIAL paste that has been designed to be used both INSIDE and OUTSIDE the mouth - that means you can use it to brush your own natural teeth, on dentures AND around dental implants. It's MUCH BETTER for your gums and dentures than regular toothpaste, which is WAY TOO ABRASIVE for dentures in particular. This new specialised toothpaste contains tea tree oil, coconut oil and aloe vera. It doesn't have any abrasives, bleaching agents nor chlorine. It has a revolutionary formula that provides a Deep Clean that will kill disease and odor- causing bacteria. I think it's the BEST denture cleaning paste that's also safe around dental implants AND your gums. It normally sells for $8.95 per tube. You can read more and place your order with a 20% discount at Dr. B Dental Solutions. Cleanadent Crystals are AMAZING. This new denture product is quite simply THE BEST way of cleaning your dentures from all Fungus infections and bacteria. There's never been anything quite like it before! It kills Candida - (thrush) - bacteria in only 20 minutes, well as Streptococcus bacteria. It also removes staining such as tea, coffee and nicotine from ALL acrylic oral appliances. 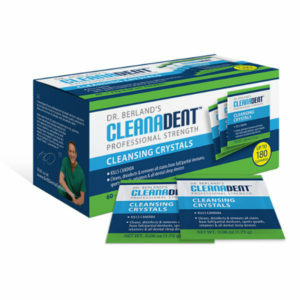 You can get a 20% discount on Cleanadent Crystals by using the discount code at the bottom of this page - AND - you will get a FREE sonic denture cleaner with your order! The standard retail price is $28.95. You can read more and place your order with a 20% discount at Dr. B Dental Solutions. 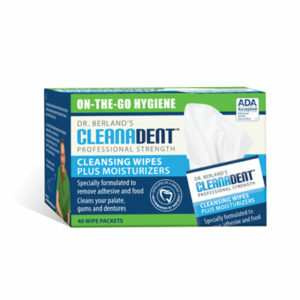 Cleanadent Wipes are an ADDITIONAL way of cleaning your denture when you're on the go, on the road. These are individually wrapped moist wipes that are infused with Cleanadent solution. These wipes can remove old adhesive, dental plaque and food from all surfaces of your dentures. They also moisturise your mouth with Vitamins A,D and E, as well as aloe vera and other natural oils. Unfortunately these special cleaning wipes are not currently available. Watch this space - I'll update this page as soon as I hear from Dr. B Dental Solutions! Sonic cleaner. I'm a great believer in sonic and ultrasonic baths for cleaning any dental appliances. This latest design of sonic cleaner by Dr. Berland incorporates ALL the latest technology to get even better cleaning than standard ultrasonic denture cleaners. When you use the Sonic cleaner with Cleanadent Crystals, you KNOW your denture will be as clean as possible! Remember, if you order Cleanadent Crystals, you AUTOMATICALLY get the Sonic cleaner FREE! 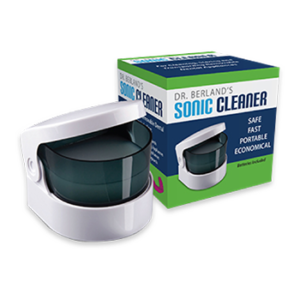 If you want to order the sonic cleaner on its own the standard price is $15.95 You can read more and place your order with a 20% discount at Dr. B Dental Solutions. Denture Solution Kit. This is a TOTAL CARE KIT which includes each of the above products. It gives you EVERYTHING you need to care for your dentures, and keep them in perfect condition, with a normal price of $39.95. You can read more and place your order with a 20% discount at Dr. B Dental Solutions . 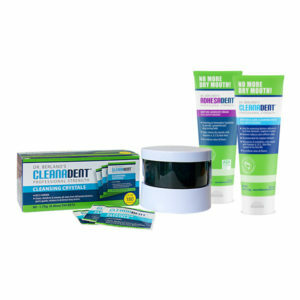 All these products from Dr. B Dental Solutions are, in my opinion, the BEST DENTURE PRODUCTS available today. I think they are great value even at the standard retail price, BUT you can get a 20% DISCOUNT by clicking on the links above for each product, and using the discount code DHA for your order. The best denture products at the best price. Unbeatable!